The money maker in SketchList 3D is the sheet good layout report. Save a sheet of $100 plywood a few times, and…. Given the number of emails with questions about the red boxes on the optimizer, we have been working the past week or so to change it’s function in cabinet design software. The big change is to take you to the form where you size a new material right after defining it. Mostly – especially with sheet goods – you know these sizes and should just put them in the form. The other improvement is to put a use – don’t use check box in the optimizer set up form. This does two things for you. 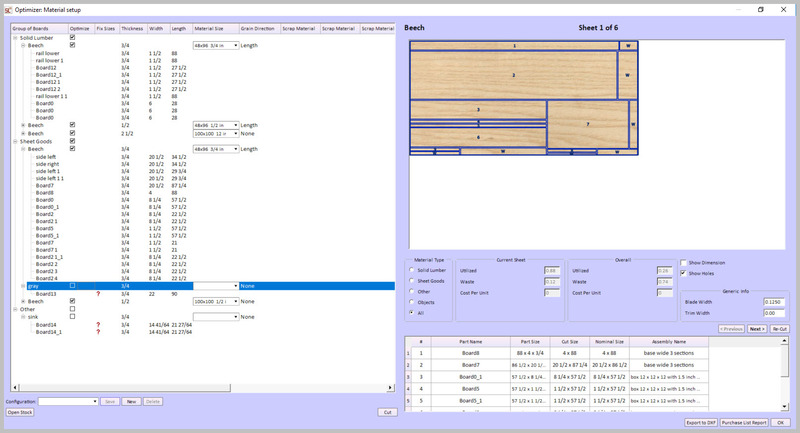 First if you put a material – board in like floor for simple design purposes – want it to show but not go through the optimizer – un-check this in the optimizer layout tool. Or if you don’t want to optimize solid lumber just sheet hoods, un-check solids and they will be ignored. The orientation and grain direction of the board are critical in getting a good optimization. So think about it as you design.